Description: With growing awareness of the devastation caused by major natural disasters, alongside integration of governance and technology networks, the parameters of humanitarian aid are becoming more global. At the same time, humanitarian instruments are increasingly recognizing the centrality of local participation. Drawing on six case studies and a survey of 69 members of the relief sector, this book suggests that the key to the efficacy of post-disaster recovery is the primacy given to local actors in the management, direction and design of relief programs. Where local partnership and knowledge generation and application is ongoing, cohesive, meaningful and inclusive, disaster relief efforts are more targeted, cost-effective, efficient and timely. Governing Disasters: Engaging Local Populations in Humanitarian Relief examines the interplay between law, governance and collaborative decision making with international, state, private sector and community actors in order to understand the dynamics of a global decentralized yet coordinated process of post-disaster humanitarian assistance. "Elegantly weaving theory with rich contextual studies, Professor Shahla Ali's Governing Disasters elevates the study of law and disasters [by] setting agendas both for scholarship and policy." "Community involvement and public-private partnership are sometimes written off as popular buzzwords. This important and carefully documented book shows, however, that they can make a major difference in the effectiveness of disaster relief." 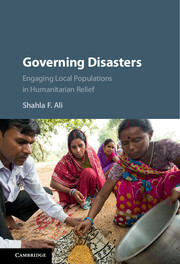 "In drawing on the new governance literature to explore the role of local actors in post-disaster humanitarian relief, Professor Ali generates important insights into the careful equilibrium of decentralization and coordination that is necessary for successful multi-level governance." "Offers a rich and comparative analysis of local participation in disaster response and recovery in six recent disasters. At a time when the international humanitarian community is stretched thin by multiple large-scale disasters, and the twin forces of conflict and larger natural disasters place millions in need of humanitarian assistance globally, there has never been a more apt time to consider seriously how best to support and enhance the capacities of local communities to respond to and manage disaster response. Governments, scholars and humanitarian and development practitioners will benefit enormously from reviewing the actual experience of local community participation in disaster recovery expertly examined in this work."